It was when I posted last time that I discovered the mistake I made! The inner saw-tooth border was supposed to be stitched in light blue, not white. Fortunately, I hadn't gotten too far with it, but still frogging silk . . ugh! With that fixed, I was finally able to move on to the free-hand stitching. The area under the last red flower was to be filled in with a large fanciful tree/flowering bush. I stared at this for ages, but I couldn't figure out how to stitch it in place accurately. There isn't a lot of extra linen here to play with. I opted to leave it, and move on to the sheep standing on the hill. This wasn't easy either. The stitching here looks a bit helter-skelter, but I had to find my way to the bottom to get anything to work! I needed to "build" the hill that the sheep was standing on first. 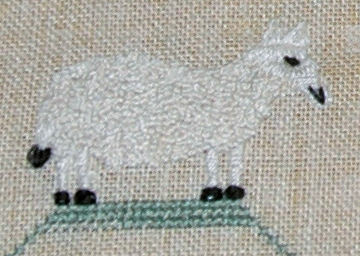 The little sheep took me over 4 evenings to finish, but I was pleased the way he turned out. The legs, head, tail and ears are done in satin stitch and then covered with black. The entire body was filled in with French knots. 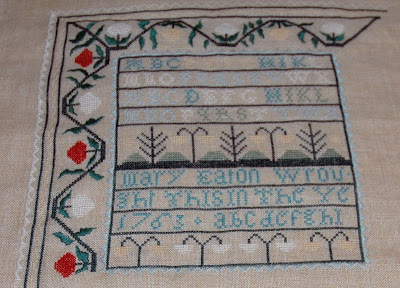 That is a lot of French knots! A single strand of silk does not make for a big knot! 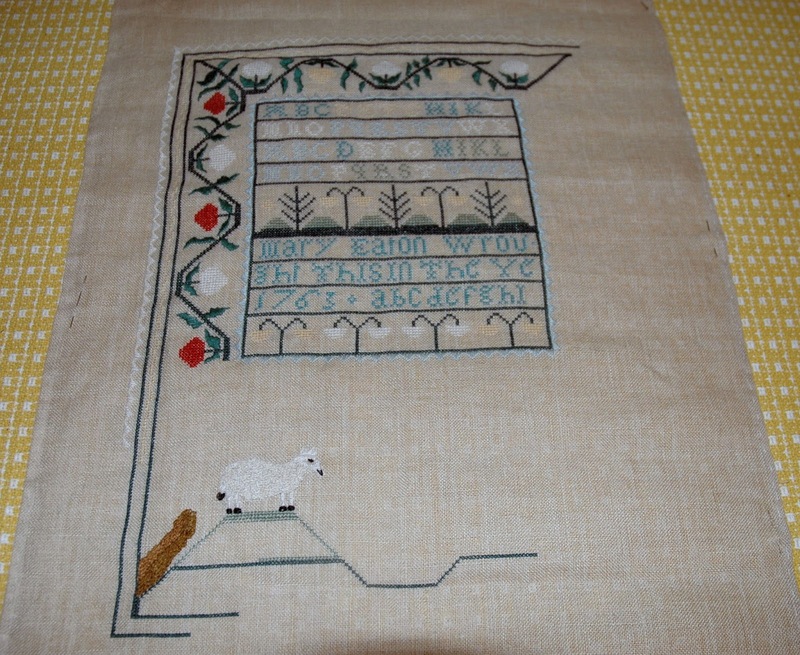 After the sheep, I started on the tree to the left of the sheep. That is the tree that goes all the way to the top. 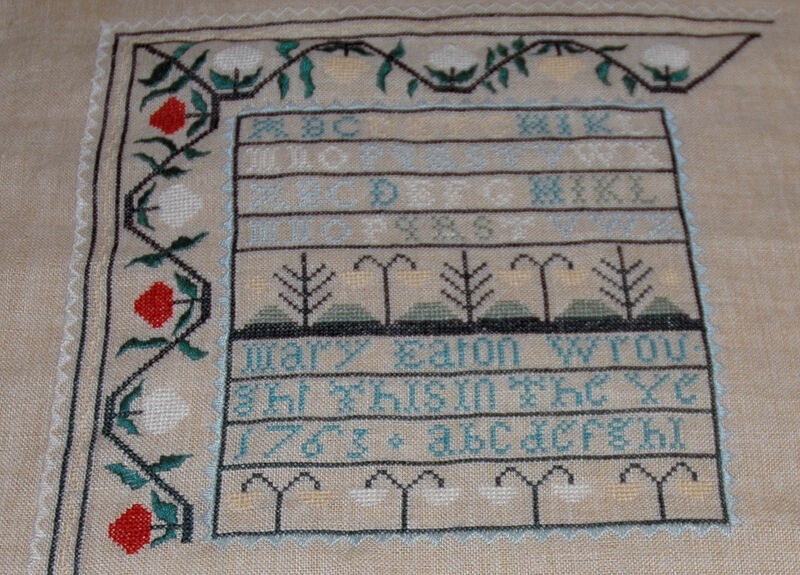 The tree trunk is filled in with a vertical stem stitch in two different shades of brown. Since I took these photos, I have made a little more progress, but there has been as much frogging as stitching! That darn tree is causing a lot of grief! I will be back soon with some more photos. So sweet...I love the cute sampler..and the sheepie is so cute..
Wow! So amazing! I love that sheep! That looks like a difficult project to me. You are doing a beautiful job! Erica, I'm so happy to have wandered onto your wonderful blog. Mary Eaton is fabulous! I so enjoyed seeing all her details. Sorry about the frogs but it looks lovely! The little sheep looks so lovely. 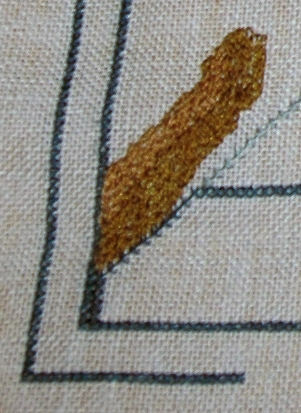 You managed great with this part of free stitching. I have never done it but can imagine that it's not easy to do. Oh my word! What a lot of french knots. The sheep looks pretty amazing though so well worth the effort!